I just love beaded jewelry ~ beads are so pretty, in all their different shapes, sizes, colours and finishes. I particularly love beads that sparkle with different colours, depending on the lighting. 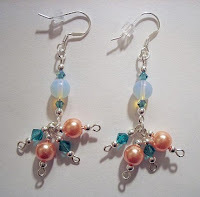 If you're looking for lovely beaded jewelry, then look no further than sweetirie. If fact, you're in luck: sweetirie is having a sale right now: buy two get one FREE!! That's right, purchase any two items from sweetirie, and get a third one FREE!!! Plus, you can take advantage of her lowered shipping, now only through the holidays! Be sure to take a look at her clearance section too, where you'll find a nice selection of items at a reduced price. 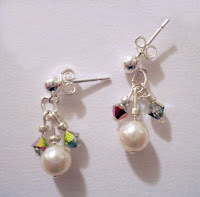 These volcano earrings are my favourite ~ see how the lovely beads reflect shades of yellow, red and green? Absolutely stunning! Trying to decide on what to get? Let me show you a few that I like that are sure to be a hit with someone on your holiday list. 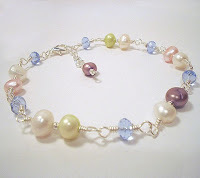 Like this fruity anklet ~ an original gift in soft hues that can be paired with just about everything. This is the perfect addition to that little black dress, or that pretty skirt you were planning on wearing to dinner. I love the contrast between the shiny freshwater pearls and the clear brilliance of the blue crystals. Need something else to get one free? What about this lovely firestorm bracelet? You can then get the matching firestorm earrings for free!! It doesn't get much better than that! 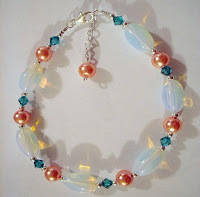 The large genuine moonstones are really complimented well with the Swarovski blue zircon crystals and the peach glass pearls ~ these two bright colours reflects the lustrous fiery shimmer of the moonstone. Silver spacer beads add to the sparkle you are definitely going to want to be wearing! One last piece to show you ~ a gorgeous necklace that you are definitely going to want! This crazy beautiful necklace is just that: an incredibly striking piece. Made with Swarovski vintage rose crystals and creamy glass pearls, the asymmetry of this design adds a touch of flair to an otherwise simple piece. 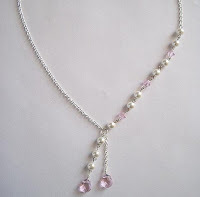 This is a perfect necklace for a blushing bride, or her bridal party.. or for anyone who has a party to attend. Or maybe prom? I think this versatile necklace will be worn again and again by whoever gets it first! This amazing shop was founded in 2005, when an addition was made to its creator's family. A kitten was adopted and named Irie, which means supreme joy ~ quite fitting for a rambunctious kitty! Sweetirie is more than happy to make a custom order for you, but does require a 50% deposit. You will work with her to create the exact piece you want and get a sketch before she starts making it, so I think it's well worth it. To request your custom design, email her at info@sweetirie.com. Please see her profile for more information on custom orders, gift certificates, shipping and jewelry care. Stop by this shop for all your beaded needs! On MySpace? Check her out there too, or on her blog, where she's featuring other artists in the 90 day challenge! That has got to be the best feature I have ever had! Thank you so so much! *hugs* You are awesome! I am going to add you to my list of Etsy features...although I am not moving quite as fast as one a day...just too much to do. lol :) Thanks again!